Duo of Hindman and Agostini score their first overall and Pro win of the season. Freiberg becomes first woman to stand on overall podium in any worldwide Lamborghini series. Hardwick doubles up on LB Cup victories at Watkins Glen. WATKINS GLEN, N.Y. (July 1, 2017) - Riccardo Agostini and Trent Hindman finally claimed their first victory of the season in the weekend's second Super Trofeo North America race at Watkins Glen International. Hindman brought the No. 1 Prestige Performance entry, representing Lamborghini Paramus, home to the checkered flag, holding off a late-race charge from Austin Versteeg who closed to finish just .541 seconds behind the race winner. The Agostini and Hindman duo made best use of their pole starting position, controlling the race from the green flag. "I knew we had a great car," said Hindman. "Riccardo [Agostini] did a fantastic job in qualifying on Friday morning and put the thing on the pole. I was definitely hanging on at the end but overall it was a fantastic race and I'm just so happy to end the weekend on a high note and move on to Road America with a win." Versteeg's second-place finish overall also netted him his second ProAm class victory after a similarly impressive performance from the 18-year-old at the season-opening round at Circuit of The Americas. The driver of the No. 7 DXDT Racing entry, representing Lamborghini Dallas, fell back early in the race, but fought back to have a mighty battle after the mandatory pitstop window with eventual third-place overall finisher Ashley Freiberg. After getting around Frieberg, Versteeg set off in chase of Hindman, who had taken over driving duties from Agostini at the pitstop. Setting a series of fast laps, he cut the lead to less than a second by race's end, but the young driver ran out of time and had to settle for the second step on the overall podium. "Everyone was super tight going up the Esses at the start and I lost a few positions there," said Versteeg after the race. "I knew we had a really good car for the long run and I just had to be smart in traffic. "Thanks to all the team for such a great bounce back. Hopefully Road America comes fast." With her third-place finish, Freiberg made history, becoming the first woman to stand on the overall podium of any of the worldwide Lamborghini Super Trofeo series. The 25-year-old leapt up from her fourth place starting position at the green flag, taking and holding second place for much of the race until she was caught by Versteeg. Eventually, she brought her No. 30 DAC Motorsports entry, representing Lamborghini Palm Beach, to the checkered flag second in the Pro category, proving her race-winning potential in only her fourth Lamborghini Super Trofeo start. The Amateur class victory went to Brian Thienes who made up for what he thought was a missed opportunity in Race 1 at Watkins Glen. Thienes started from the pole in both races and fell back at the green flag of each. While he was unable to recover in the first race of the weekend, the driver of the No. 17 US RaceTronics entry, representing Lamborghini Beverly Hills, had better luck in Race 2, battling with Patrice Brisebois in the second stint for the class lead. Thienes prevailed on Lap 19, and kept the position until race's end, earning his second victory of the season. "It felt like the team got some redemption and we were fast all weekend in our class," said Thienes. "Congratulations to the team for putting the car back together and doing a really good job with a really good set up." The LB Cup class win came down to the narrowest of margins, as Ryan Hardwick eked out his second triumph of the weekend by .081 seconds over J.C. Perez. Hardwick finished second on the track to Perez in his No. 2 Dream Racing Motorsport entry, representing Lamborghini Atlanta, but a 1.5-second penalty was issued to Perez for a pit stop that did not meet the minimum time requirement. During the race, Hardwick did not know about Perez's impending penalty and was pleasantly surprised by his winning result. "I had no idea, my team wasn't telling me," said Hardwick. "They were obviously telling me to push, but I had no idea. [Perez] had some bad luck in traffic and it slowed him down. But I've raced a long time and I know that it's not over until it's over." The winner of Race 1 and championship leader in the Pro category, Richard Antinucci, encountered problems after starting from the outside of the front row in the weekend's second race. The No. 16 Change Racing driver, representing Lamborghini Carolinas, finished in 16th position overall and fifth in the Pro category, breaking his perfect streak of three race wins. The 2015 series champion still leads in the Pro category in provisional championship points, but Race 2 at Watkins Glen proved that the competition won't make things easy for him as the series heads on to Road America in one month's time. Tape-delayed coverage of Watkins Glen International will air on the CBS Sports Network on July 30, 2017 at 5:30 p.m. ET. The coverage will feature live commentary on both the broadcast and live streams. Lamborghini provided world-class hospitality this weekend for clients and guests of Lamborghini dealers. Guests also participated in the IMSA Hot Lap Experience - high-speed rides around the circuit in a Lamborghini. 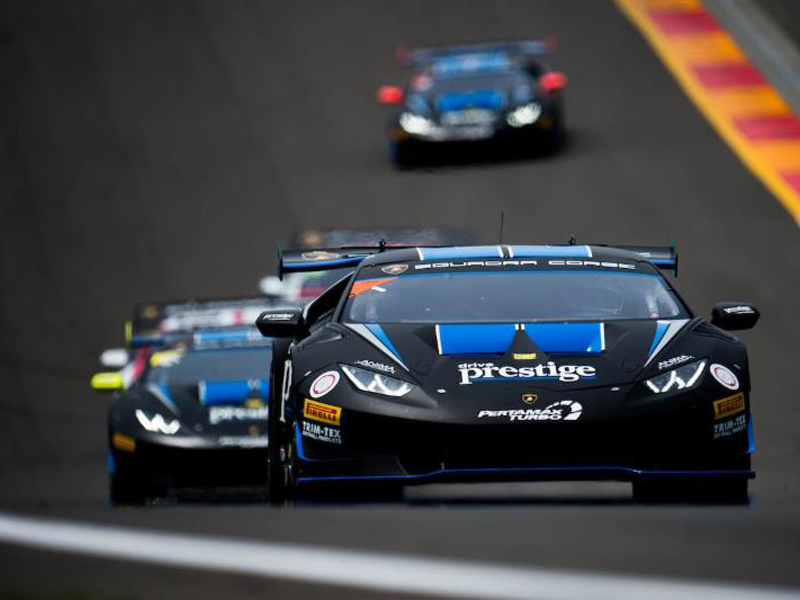 The next Lamborghini Super Trofeo North America event will be August 4-6 at Road America as part of the Continental Tire Road Race Showcase in conjunction with the IMSA Weathertech SportsCar Championship. "I knew we had a great car. Riccardo [Agostini] did a fantastic job in qualifying on Friday morning and put the car on pole. The only question was how was it going to be at the end of the race and I think the time sheets will speak for itself. I was definitely hanging on at the end but overall it was a fantastic race and I'm just so happy to end the weekend on a high note and move on to Road America with a win. Riccardo and I have been knocking on the door of a win overall for the last three races now. Yesterday was definitely a disappointment running second and having a wheel come off, but it was just a great way to wrap up the weekend. Big thanks to the Prestige Performance/Wayne Taylor Racing guys for all their efforts. Just phenomenal weekend put together by everybody. We've got a lot to learn from this weekend so we're going to go back and reset and refocus for Road America, but again, just very happy with the result that we have." "For me the race was great. I started from the pole so not a big deal. We had a tricky start with [Richard] Antinucci so I just tried to make my own pace and to gain some time lap-by-lap. We were unlucky yesterday. The last lap we had a tire problem so we had to stop. But I am pretty confident for the next races." "Really strong bounce back after yesterday. Unfortunately, we had an issue with the car that didn't allow us to finish the race but the team did a great job getting the car back together and it was just a push. Everyone was super tight going up the Esses at the start and I lost a few positions there, but I knew we had a really good car for the long run and I just had to be smart in traffic. I just kept pushing. The car was really, really good and I can't thank everyone on DXDT enough and my driver coach Jonatan Jorge from JJRD. He's the one that's allowed me to adjust to these cars so fast and without him I don't know where our pace would be right now. It was amazing and I want to thank all my sponsors Size Slim, MuscleEgg, and dEp PATCHand just thanks to all the team for such a great bounce back. Hopefully Road America comes fast." "It felt like the team got some redemption and we were fast all weekend in our class. Congratulations to the team for putting the car back together and doing a really good job with a really good set up. It handled really good. Peter Jacobs set the car up just perfectly for me and all I had to do was drive it. (Did you know that J.C. [Perez] had a penalty?) "I had no idea, my team wasn't telling me. They were obviously telling me to push, but I had no idea. He had some bad luck in traffic and caught some lapped traffic or some constant traffic and it slowed him down. He was quicker by almost a second, but I've raced a long time and I know that it's not over until it's over. These races are usually won and lost in the last couple minutes, so I just pushed as hard as I could and I was just trying to get close and it worked out in my favor. Next time it may go the other way." June 29-July 1 Watkins Glen International Watkins Glen, N.Y.
Aug. 4-6 Road America Elkhart Lake, Wis.
Aug. 25-27 VIRginia International Raceway Danville, Va.
Sept. 22-24 Laguna Seca Monterey, Calif.